A pretty girl arrives in town and chases Chester, who's happy for her to do so, but the young woman has a secret that may land her in jail. Dennis Weaver made this routine script watchable. 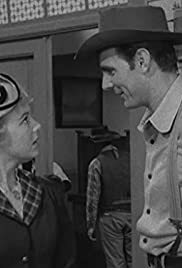 The regular story of Chester Goode continues in this episode as Chester becomes smitten with a blond beauty that happens to get off the stage in Dodge City. Edna Walston is the young woman that Chester takes a shine as he helps her upon arriving at the stage depot in Dodge. It seems that Edna is wanting to start a new life and appears to be sweet on Chester as she wishes to know everything about being the Marshal's assistant. Everything goes great until one day Edna steals a letter that was intended for Marshal Dillon. It appears that Edna is trying to hide some secret from the Marshal Dillon. Chester is torn on what to do since he really is sweet on Edna. Dennis Weaver, when given a large part, always comes through to produce a good watchable show. And in this episode it comes across so well that the entire program is made much better just by Mr Weaver's performance. The character Chester will always be one that the Marshal can always trust and it comes through very well in this episode. Good watch.